Looks comfy, right? You can't get comfortable yet. 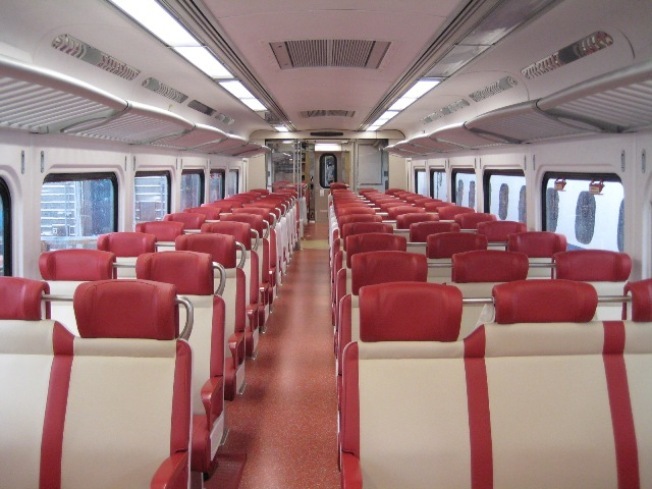 While Governor M. Jodi Rell announced this week that the first of 300 new M-8 rail cars would be shipped next week from Japan, a report in the News-Timessays daily commuters may be waiting a little longer to ride them. Extensive testing that needs to be done on the cars before they are put in service could keep passengers from riding them until late 2010 at the earliest, state Transportation Commissioner Joseph Marie told the News-Times. The tests are required to make sure the cars run on the New Haven line's tracks without any glitches and could take more than six months, according to Marie. The cars are expected to arrive by April and the track testing will begin shortly thereafter. While commuters await their arrival, the state is deciding how much fares will have to increase to pay for the new cars. The DOT plans to hold public hearings on a previously approved 1.25 percent fare increase to be implemented between 2010 and 2017 to help pay the cost of the new M-8 cars.